Can you spot Mr. Angry Pants? I have a problem with being a perfectionist. I wish this meant that everything I tried to do turned out perfect. Instead, what it means is that the first time I do something, it is always terrible. So I do it again, and it is less terrible. Then, the third time, it’s not terrible, but it could be better. The result of this phenomenon is that many of my actions follow the same, neurotic pattern. I can be found studying how to accomplish a new task for days before actually doing it (“But let’s look up the best recipe for plantains” I tell my sister, who, ignoring me, just chucks them onto a sauce pan, and finds they turn out perfectly fine). When outside, I try to pull out the last of the tiniest weeds from the ground long after everyone else is bored and wants to go inside, and just the other day, I realized I am probably going to re-write this blog post several hundred times to get it just right, and probably forget about it after a week of tinkering with it, and never hit ‘publish’. So in an effort to throw caution to the wind, I will only revise this post once. Okay, maybe twice. Eight–eight times. This is Mr. Angry-Pants, hanging out with Mr. Escaped Convict, both removed from the happy, normal Minions living in Minion-Land. The good thing about minions is that they are most “perfect” when they look a little demented. I recently discovered a great book, called “The Life Changing Magic of Tidying Up”, by Marie Kondo, the successful Japanese consultant who developed the “Kon-Mari” method of organization. My husband likes to say that every time I read a good book, I become a little crazy. I would like to say that his argument is baseless, but then he reminds me of the three months I kept talking about farming after reading “The Dirty Life” by Kristin Kimball; the four months I went to the gym every day after reading “The Power of Habit”by Charles Duhigg, and not to mention my long-standing, but still unrealized desire to be invited to study at Hogwarts. Husband’s Pants. No one is safe from my tidying rampage. 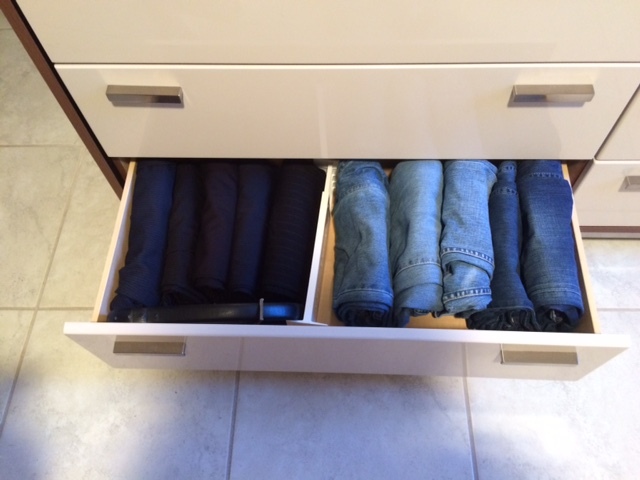 I was not allowed to photograph the underwear drawer. To everyone’s general annoyance, all I’ve been talking about for the last week and a half is how different categories of my possessions have become “KonMari’d”, and how they all now “spark a joy”. The great thing about this method of tidying is that it takes into account that we are all in fact lazy and pointlessly attached to our ridiculous memorabilia. But the most interesting part is the philosophy behind the technique—which relies on the premise that maybe what you are meant to do with your finite time in this long expanding universe is whatever will make your soul spark with joy. And the simple, meditative act of thinking about performing the actions and hanging onto the objects which truly ‘spark joy’ for you make you connect more closely to who you are–one little action, or one little button–at a time. 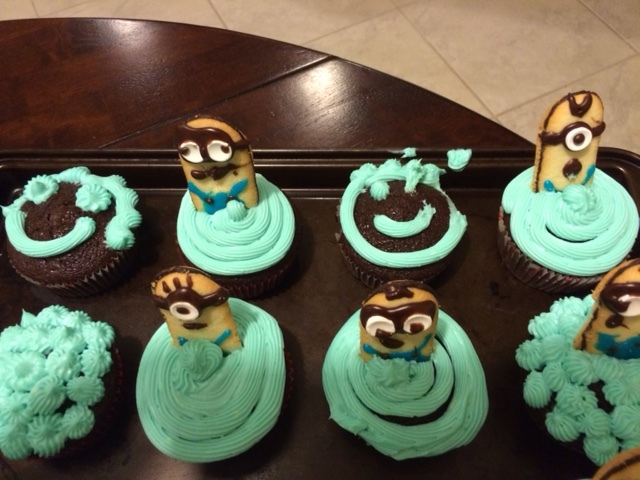 So ever since I saw Nerdy Nummies’ Rosanna Pansino make these Minion cupcakes, I was itching to make them, and only needed an excuse. Mr. Happy Pants. We didn’t name all of them, but we should have. The other weekend, my oldest best friend came to visit, and that was my excuse. 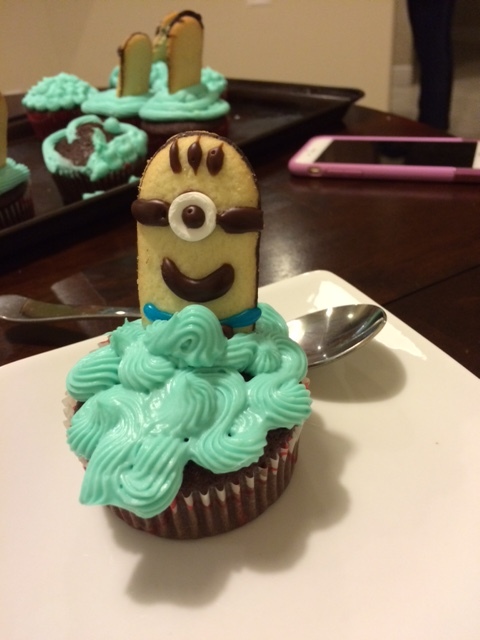 She needed minion cupcakes in her life. 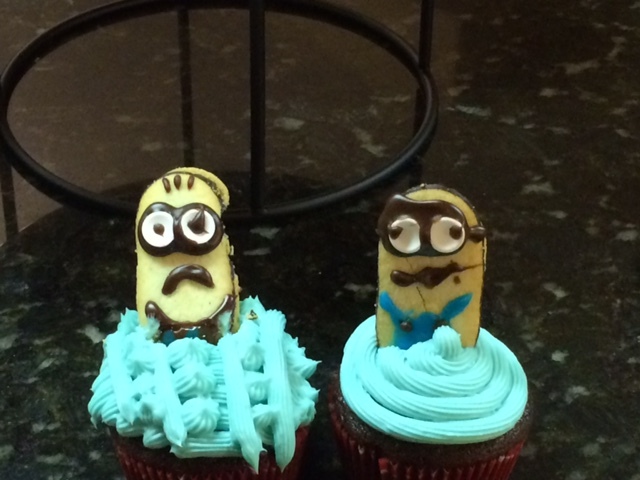 I needed minion cupcakes in my life. 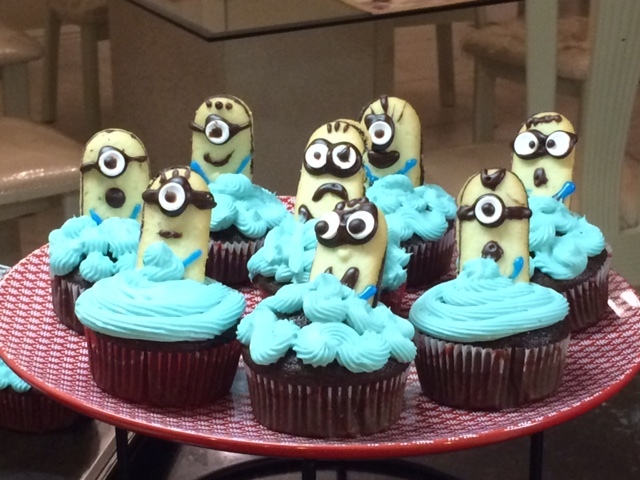 In fact, I can’t think of anyone who wouldn’t need minion cupcakes in their life. My daughter stuck her foot on the smiley face. In her book, Marie Kondo claims that she is always surprised by the seemingly random things people are in love with–old things, tattered things, things that you wouldn’t think twice to chuck in the bin. As it turns out “perfection” or true tidiness, involves embracing those aspects of ourselves which are imperfect, and arranging them around us in a way that makes us happy. Mr. Angry Pants disrupts the Normal citizens of Minion Land. Look at their adorable little demented faces. 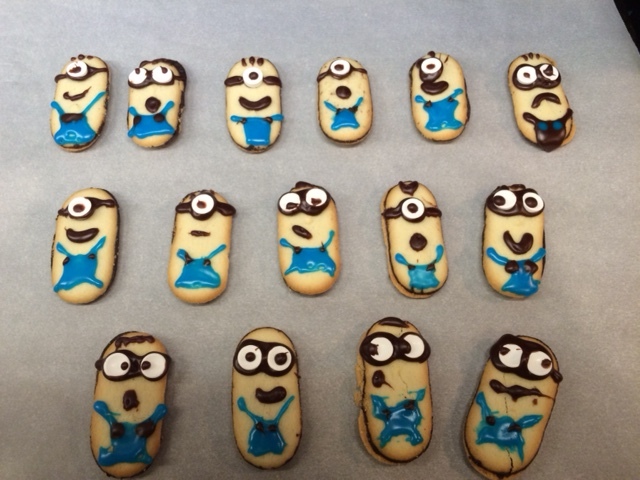 None of these minions are drawn perfectly. But at least for me, looking at their abnormal, imperfectly assembled faces sparks joy. At least until I eat them. In a large bowl, mix flour, sugar and salt. In a measuring cup, add yogurt, 2 eggs, baking soda and vanilla. Melt butter on a saucepan. Add cocoa powder to it. When the butter is all melted, add coffee. Stir until slightly bubbly; just a few minutes. Stir into flour mixture. Add yogurt mixture to flour mixture. Cream together room temperature cream cheese and butter. Add vanilla, powdered sugar and food coloring. Put into a piping or ziploc bag, and attach whatever tip you want. Separate out the white smarties from the other colors. Stick it onto the milano cookie with chocolate icing. 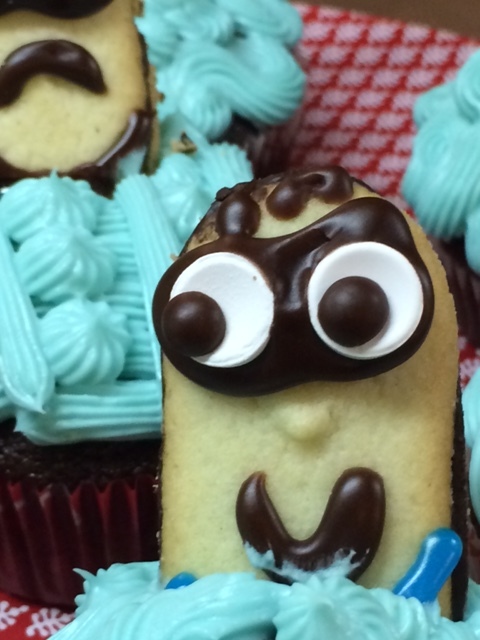 Make eyeballs, hair, and glasses with chocolate icing. Make overalls with blue icing and add buttons with brown icing. 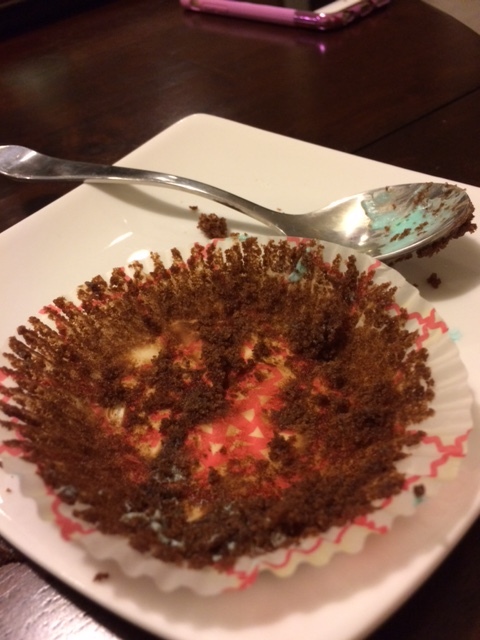 Once they are dry, stick them into the frosted cupcakes. Enjoy getting to know your minion community. And then eat them, mercilessly, one by one.